Three Letters of Swami Vivekananda. (b) His conviction in the Vedantic ideal and his living of the ideal. (c) Tremendous action and yet tremendous poise and renunciation and selflessness. Any of you may join any party you like, I have no objection, no, not in the least, but travelling this world over I find that save and except his (Sri Ramakrishna) circle alone, everywhere else thought and act are at variance. For those that belong to him, I have the utmost love, the utmost confidence. I have no alternative in the matter. Call me one-sided if you will, but there you have my bona fide avowal. 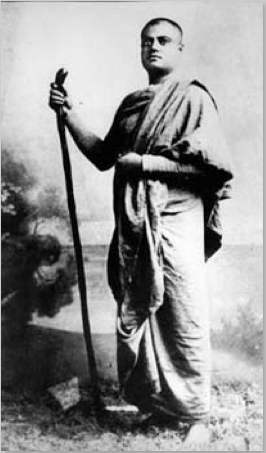 If but a thorn pricks the foot of one who has surrendered himself to Shri Ramakrishna, it makes my bones ache. All others I love; you will find very few men so unsectarian as I am; but you must excuse me, I have that bit of bigotry. If I do not appeal to his name, whose else shall I? It will be time enough to seek for a big Guru in our next birth; but in this, it is that unlearned Brahmin who has bought this body of mine for ever. I give you a bit of my mind; don’t be angry, pray. I am your slave so long as you are his — step a hair’s breadth outside that, and you and I are on a par. All the sects and societies that you see, the whole host of them, inside the country or out, he has already swallowed them all, my brother. यज्जुहोषि यत्तपस्यसि यदश्नासि – Whatever sacrifices you perform, whatever penances you undergo, whatever you eat” — surrender everything to his feet. What on earth do we want? He has given us refuge, what more do we want? Bhakti is verily its own reward — what else is needed? My brother, he who made men of us by feeding and clothing and imparting wisdom and knowledge, who opened the eyes of our self, whom day and night we found the living God — must we be traitors to him!!! And you forget the mercy of such a Lord! The lives of Buddha and Krishna and Jesus are matters of ancient history, and doubts are entertained about their historicity, and you in spite of seeing the greatness of Shri Ramakrishna’s life in flesh and blood sometimes lose your head! Fie upon you! I have nothing to say. His likeness is being worshipped in and out of your country, by godless and heartless men, and you are stranded at times on disbelief!! In a breath he will create for himself hundreds of thousands of such as you are. Blessed is your birth, blessed your lineage, and blessed your country that you were allowed to take the dust of his feet. Well I can’t help. He is protecting us, forsooth — I see it before my eyes. Insane that you are, is it through my own strength that beauty like that of fairies, and hundreds of thousands of rupees, lose their attraction and appear as nothing to me? Or is it he who is protecting me? He who has no faith in him and no reverence for the Holy Mother will be a downright loser, I tell you plainly. I just received your beautiful note…. Well, sometimes it is a good discipline to be forced to work for work’s sake, even to the length of not being allowed to enjoy the fruits of one’s labour…. I am very glad of your criticisms and am not sorry at all. The other day at Miss Thursby’s I had an excited argument with a Presbyterian gentleman, who, as usual, got very hot, angry, and abusive. However, I was afterwards severely reprimanded by Mrs. Bull [Swamiji’s host] for this, as such things hinder my work. So, it seems, is your opinion. I am glad you write about it just now, because I have been giving a good deal of thought to it. In the first place, I am not at all sorry for these things — perhaps that may disgust you — it may. I know full well how good it is for one’s worldly prospects to be sweet. I do everything to be sweet, but when it comes to a horrible compromise with the truth within, then I stop. I do not believe in humility. I believe in Samadarshitva — same state of mind with regard to all. The duty of the ordinary man is to obey the commands of his “God”, society; but the children of light never do so. This is an eternal law. One accommodates himself to surroundings and social opinion and gets all good things from society, the giver of all good to such. The other stands alone and draws society up towards him. The accommodating man finds a path of roses; the non-accommodating, one of thorns. But the worshippers of “Vox populi” go to annihilation in a moment; the children of truth live for ever. I will compare truth to a corrosive substance of infinite power. It burns its way in wherever it falls — in soft substance at once, hard granite slowly, but it must. What is writ is writ. I am so, so sorry, Sister, that I cannot make myself sweet and accommodating to every black falsehood. But I cannot. I have suffered for it all my life. But I cannot. I have essayed and essayed. But I cannot. At last I have given it up. The Lord is great. He will not allow me to become a hypocrite. Now let what is in come out. I have not found a way that will please all, and I cannot but be what I am, true to my own self. “Youth and beauty vanish, life and wealth vanish, name and fame vanish, even the mountains crumble into dust. Friendship and love vanish. Truth alone abides.” God of Truth, be Thou alone my guide! I am too old to change now into milk and honey. Allow me to remain as I am. “Without fear — without shopkeeping, caring neither for friend nor foe, do thou hold on to Truth, Sannyâsin, and from this moment give up this world and the next and all that are to come — their enjoyments and their vanities. Truth, be thou alone my guide.” I have no desire for wealth or name or fame or enjoyments, Sister — they are dust unto me. I wanted to help my brethren. I have not the tact to earn money, bless the Lord. What reason is there for me to conform to the vagaries of the world around me and not obey the voice of Truth within? The mind is still weak, Sister, it sometimes mechanically clutches at earthly help. But I am not afraid. Fear is the greatest sin my religion teaches. The last fight with the Presbyterian priest and the long fight afterwards with Mrs. Bull showed me in a clear light what Manu says to the Sannyasin, “Live alone, walk alone.” All friendship, all love, is only limitation. There never was a friendship, especially of women, which was not exacting. O great sages! You were right. One cannot serve the God of Truth who leans upon somebody. Be still, my soul! Be alone! and the Lord is with you. Life is nothing! Death is a delusion! All this is not, God alone is! Fear not, my soul! Be alone. Sister, the way is long, the time is short, evening is approaching. I have to go home soon. I have no time to give my manners a finish. I cannot find time to deliver my message. You are good, you are so kind, I will do anything for you; and do not be angry, I see you all are mere children. Dream no more! Oh, dream no more, my soul! In one word, I have a message to give, I have no time to be sweet to the world, and every attempt at sweetness makes me a hypocrite. I will die a thousand deaths rather than lead a jelly-fish existence and yield to every requirement of this foolish world, no matter whether it be my own country or a foreign country. You are mistaken, utterly mistaken, if you think I have a work, as Mrs. Bull thinks; I have no work under or beyond the sun. I have a message, and I will give it after my own fashion. I will neither Hinduise my message, nor Christianise it, nor make it any “ise” in the world. I will only my-ise it and that is all. Liberty, Mukti, is all my religion, and everything that tries to curb it, I will avoid by fight or flight. Pooh! I try to pacify the priests!! Sister, do not take this amiss. But you are babies and babies must submit to be taught. You have not yet drunk of that fountain which makes “reason unreason, mortal immortal, this world a zero, and of man a God”. Come out if you can of this network of foolishness they call this world. Then I will call you indeed brave and free. If you cannot, cheer those that dare dash this false God, society, to the ground and trample on its unmitigated hypocrisy; if you cannot cheer them, pray, be silent, but do not try to drag them down again into the mire with such false nonsense as compromise and becoming nice and sweet. I am living with Landsberg at 54 W. 33rd Street. He is a brave and noble soul, Lord bless him. Sometimes I go to the Guernseys’ to sleep. Lord bless you all ever and ever — and may He lead you quickly out of this big humbug, the world! May you never be enchanted by this old witch, the world! May Shankara help you! May Umâ open the door of truth for you and take away all your delusions! Letter 3: – Written to a brother of the Ramakrishna Order. I feel I have been working as if under an irresistible impulse for the last ten days, beginning from Kashmir. It may be either a physical or a mental disease. Now I have come to the conclusion that I am unfit for further work. . . . I now understand that I have been very harsh to all of you. But I knew, however, that you would bear with all my shortcomings; in the Math there is no one else who will do so. I have been increasingly harsh to you. Whatever has happened is now past — it is all the result of past Karma. What is the good of my repentance? I do not believe in it. It is all Karma. Whatever of Mother’s work was to be accomplished through me, She made me do, and has now flung me aside breaking down my body and mind. Her will be done! Now I retire from all this work. In a day or two I shall give up everything and wander out alone; I shall spend the rest of my life quietly in some place or other. Forgive me if you all will, or do what you like. Mrs. Bull has given much of the money. She has implicit confidence in Sharat. Do the work of the Math with Sharat’s advice; or do as you will. But I have all along been like a hero — I want my work to be quick like lightning, and firm as adamant. Likewise shall I die also. Therefore kindly do my work for me — no question of success or defeat enters here at all. I have never retreated in a fight — shall I now . . . ? There is success and failure in every work. But I am inclined to believe that one who is a coward will be born after death as an insect or a worm, that there is no salvation for a coward even after millions of years of penance. Well, shall I after all be born as a worm? . . . In my eyes this world is mere play — and it will always remain as such. Should one spend six long months brooding over the questions of honour and disgrace, gain and loss pertaining to this? . . . I am a man of action. Simply advice upon advice is being given — this one says this, that one says that; again that man threatens, and this one frightens! This life is not, in my view, such a sweet thing that I would long to live through so much care and caution and fear. Money, life, friends, and relatives, and the love of men and myself — if one wants to enter into work fully assured beforehand of all these — if one has to be so much ridden with fear, then one will get just what Gurudeva used to say, “The crow thinks itself very clever but . . .” (The crow thinks itself very clever, but it cannot help eating filth.) — well, he will get that. After all, what is the purpose behind all these — money and wealth, Maths and institutions, preaching and lecturing? There is only one purpose in the whole of life — education. Otherwise what is the use of men and women, land and wealth? — certainly there is, or there will be born one equal to me”; some one or other will certainly arise from these thousands of devotees of Shri Ramakrishna who will be like me, and who will be able to understand me. O hero, awake, and dream no more. Death has caught you by the forelock . . . still fear not. What I have never done — fleeing from the battle — well, will that happen today? For fear of defeat shall I retreat from the fight? Defeat is the ornament the hero adorns himself with. What, to acknowledge defeat without fighting! O Mother, Mother! . . . Not one capable of even playing second fiddle and yet the mind filled with petty self-importance, “We understand everything”. . . . Now I retire; . . . everything I leave in your control. If Mother sends me men again in whose heart there is courage, in whose hands strength, in whose eyes there is fire, real children of the Mother — if She gives me even one such, then I shall work again, then I shall return. Otherwise, I shall take it that, by Mother’s will, this is the end. I am in a tremendous hurry, I want to work at hurricane speed, and I want fearless hearts. I have rebuked poor Sarada severely. What to do? . . . I do scold; but I also have much to complain. . . . Almost suffocated by short breathing, standing and standing, I have written an article for him. . . . It is all good, otherwise how will renunciation come? . . . Will Mother in the end kill me with attachment? I have offended all of you — do what you want. — the support that is fearlessness — may She make you all fearless. This I have seen in life — he who is over-cautious about himself falls into dangers at every step; he who is afraid of losing honour and respect, gets only disgrace; he who is always afraid of loss always loses. . . . May all good attend you all.Yours affectionately,VIVEKANANDA. BTW: I think the third sentence from the top “I love to them over read again and again” needs to have the words rearranged so it ‘s grammatically correct.